I’m slowly processing mountains of data from the Virginia Glee Club 140th Anniversary Weekend. After a long delay, the audio recordings of the alumni sings and the banquet speakers have been posted at the Virginia Glee Club wiki. 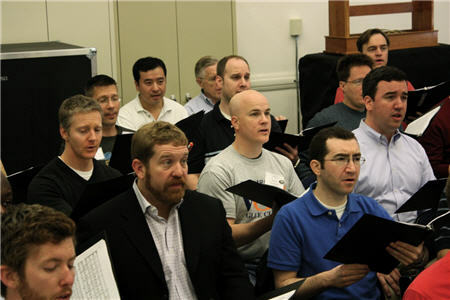 While there are a few glitches in the performances here and there (unsurprising given only a morning’s rehearsal), what’s moving to me is hearing voices from multiple Glee Club eras come together on both Club standards (“Shenandoah”, the Biebl “Ave Maria,” the “Winter Song”) and one or two that were new to many. I think for me the standout performance is the Fenno Heath arrangement of “Sometimes I Feel Like a Motherless Child” with Morgan Whitfield reprising a solo he had sung almost twenty years previously. You’d never know that most of the alums had never sung the work with John Liepold. The banquet speeches are good too, if you’re into that sort of thing. Of particular interest to me was the description by Patrick Garner about how the Club’s first European tour came to be. But the whole thing is well worth a listen. Next project: sort through a few gigs of high resolution photos from the weekend and get them up on the site.